Merc gets welded, Disco clutch fails – HubNut – celebrating the average! Sorry for the lack of Blogs. I got all of a grump last week, mainly because I was fed up with my increasingly-broken fleet. First of all, the Merc got welded up and I then overhauled the rear brakes. Thankfully, I’d caught the rot before it got too bad, so my mate Dave made busy with his welder and made it all solid again. Both rear subframe mountings were repaired and there was a bit more work needed to the rear of the nearside wheelarch too. 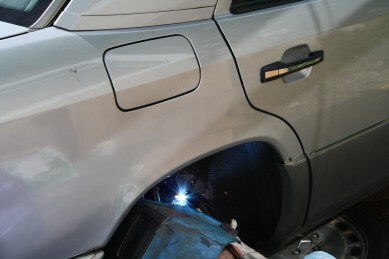 With the car solid again, I set about fitting new rear discs, pads, flexi-hoses and one caliper. It no longer makes horrible scraping noises and the brake pedal feels a bit better. With that success chalked up, I got my mate to grind off the rearmost fixing nut on the 2CV. The thread it attaches too was just spinning as it was no longer captive. That was very much a short-term measure and I’m hoping to get it back to Dave so I can get a new thread welded into place. She’ll be attending the Capel Bangor Show this weekend, so folk are just going to have to cope with her looking absolutely dreadful. 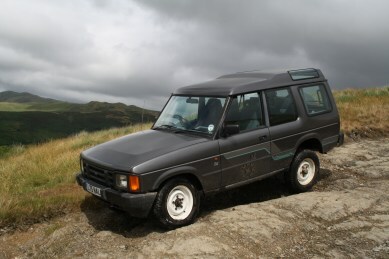 Then I thought it might be nice to do a little greenlaning in the Discovery. I always enjoy trekking around Nant-y-Moch and thought I’d tackle the ‘washout’ section. This can be pretty horrendous, but was fairly tame this time around. Repairs I and fellow West Wales Laning (now Wales and Wye Laning) members carried out last summer have held up well. Progress on the lanes wasn’t too tricky. Staying in low range, I could pull away in first, second or third depending on what terrain lay ahead. If it was a steep descent, I had to stop, select low first and crawl down it. Some sections required the gentle pace of low second, while others were fine in low third. I just stopped to change gear, then started with it in gear. Jerky but no problem. Roads were another matter entirely. It is possible to drive a manual car without a clutch, but it does require quite a lot of skill! The weak synchromesh on second gear didn’t help. Happily, I managed to get the 15 miles home without too much trauma. I then topped up the level and bled the slave cylinder. Success! However, I suspect the slave has failed and is allowing fluid to escape, so it’s only a temporary fix. A slave cylinder overhaul kit is on the way.